I recently completed a review of a Rock River Arms Coyote Carbine .223 Rifle that I borrowed from my brother-in-law. He purchased the Burris AR-P.E.P.R ™ Mount to mount his scope on his rifle, so I decided that this would be a good product to review also. Normally I like to add photos of the packaging and everything in the box, but since all I received was the rifle with the mount already installed, I had to make the best of it. You can purchase this mount now from Midway USA for $69.99 plus S&H. To start off the review, the description below in italics is the information directly from the Burris website along with a photo and the technical data. This mount comes in two different models, 1" and 30mm. The model being reviewed is the 1" model since it is used to attach a Nikon Coyote Special 1" tube scope. I would expect the 30mm to be extremely similar. Proper Eye Position Ready for combat rifle scopes, this mount provides 2" of forward scope positioning on the M-4 and AR-15 platform. Ring bases are milled as a single, tough unit, and ring tops feature Picatinny tops for mounting additional accessories. 1" 8.3 oz. 1.0" 1.60" 2.44" 4.17" 2.15"
30mm 8.7 oz. 1.0" 1.75" 2.67" 4.17" 2.15"
Since I'm never satisfied with only showing the manufacturers photos, I had to include some of my own. This series of 6 photos below gives you a close up view of each side of the mount. Remember that if you click on a photo it will bring up a higher resolution photo. One thing you will see in the photos is that this mount comes with integrated Picatinny rails on the caps. I see this as a plus, especially for those who may be considering using these mounts on a rifle that does not come with other accessory rails. Also you should notice that all the parts are thick which translates to ruggedness. Each cap is attached with 6 screws. I'm sure that 4 screws per cap would be sufficient for the average user, but the added screws help to provide strength for rough conditions. The mount also comes with an allen shaped torx wrench. The torx head configuration of the screws allows for more torque with less chances of stripping. When you disassemble the mount to the level needed for installation, it breaks down into these primary components below. You get the base assembly, two caps and 12 screws. The body of the base assembly and caps are made from aluminum while the rail attachment plate, rail attachment bolts, nuts and cap screws are made form steel. The mount weighed in at 0.53 pounds (8.48 ounces). This is slightly heavier than the 8.3 ounces advertised for the 1" ring model. When the mount is installed on the rifle with the scope adjusted to an eye relief position that is natural for the shooter, you can see below that the offset position of the forward mount is needed since the mount is forward of the upper receiver rail. I installed and torqued the rail attachment nuts and cap screws to Burris's recommended torque per their instructions. I'm glad that Burris provided this information because I feel I have a tendency to under tighten critical components due to the fear of stripping threads. When you consider the price, ruggedness and added rails on the caps, this mount represents a good value. If you have sufficient room on your upper rail to use a two piece mount and are weight conscious, you may want to consider another mount. This mount was in no way a lite weight system, but the additional mass only adds to the ruggedness. 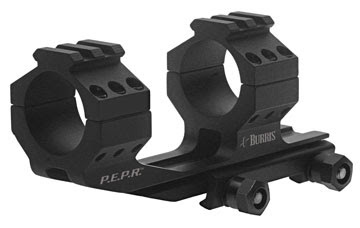 Would I recommend the Burris PEPR Mount? Actually I already did recommend this mount to my brother-in-law before he purchased it. I have an engineering buddy of mine that did quite a bit of research into mounts and he found that this was one of the quality/value choices on the market. After he showed me his research, I had to agree. My personal opinion is that this mount looks great on a AR style rifle. You can see it below installed on a Rock River Coyote Carbine with a Nikon Coyote Special Scope. Thanks for the Review. It helped me decide on which mount to purchase. I ordered mine tonight and it will be mounted on my DPMS .308 ready to shoot by next Sat. Thanks again!!! Thanks for a great review.The only question i would have is repeat of zero after removing and reinstalling? I am going to buy this mount to mount a scope on my ARMALITE AR-10 i just finished putting together. thanks for helping me make up my mind..
David, thanks for the feedback. Since both of the rifles with the these mounts I have tested were loaners and have returned them, I don't have any real hard data on repeatbility of zero after removal. It is a great point and I wish I had done that test. I will plan to do that in the future. Thanks. Great review to start. One glaring omission though is whether the scope mount will hold zero or return to zero when removed. I feel that is a very important parameter that should not be overlooked. Otherwise good job. Another test that should be done of any optic mount is whether or not the rings need lapped. Any ridges, uneven or out of shape rings can damage your optic and put undue stress on it. When you start talking about some of the more expensive optics this becomes very important. On a side note, I think the rails are more cosmetic than functional. You can't mount anything to them because it will either interfere with the elevation knob or the magnification adjustment. Thanks for the review and pictures (sometimes they're worth more than words). In response to the above comment: You can in-fact mount stuff on the top and still use all the adjustments of the scope. The Burris FastFire relex sight being a prime example. Also a light or laser would work with only one ring. Thanks for the review. I wish I would have known about this ar 15 scope mount when I got mine. I didn't know you could get mounts offset 2 inches like this. My AR is a little annoying to shoot because the scope is back too far, I may have to get one of these. I have the QD (quick detachable) version and it returns to zero. I forgot. Magpul rear BUIS sits underneath the scope eye piece on the rail. To use the BUIS, take the mount w/ scope off by using the two QD levers. To put the mount w/ scope back on, put it on the rail, push forward and close levers. Back to zero. This version should work the same and return to zero, but you need a wrench. I have one of these that I installed on my 300 AAC SBR build. It's certainly built solid and I like the fact that I can remove it quickly in case I want to switch to iron sights. Be sure to keep a close eye on the hardware though. I have heard some folks tell me that they have a tendancy to back off at times which will cause your scope to be loose. This has never happened on mine, so maybe Burris has fixed this issue. Could you post the proper TQ spec for the caps? I have one of these and didn't receive any instructions. Amazing Review. I am really seeing something which i have never seen before in a review. I have been searching for quite a long time regarding the Ar 15 Scope. Read many reviews. But i must tell you that your review is something quite amazing. Dear Shopiwave. Well i will fully agree with you because i have also been searching for the Ar 15 Scope for quite a long time. But never find such a useful guide as this is. Really amazed me. Thanks for the post. Keep posting such useful articles.